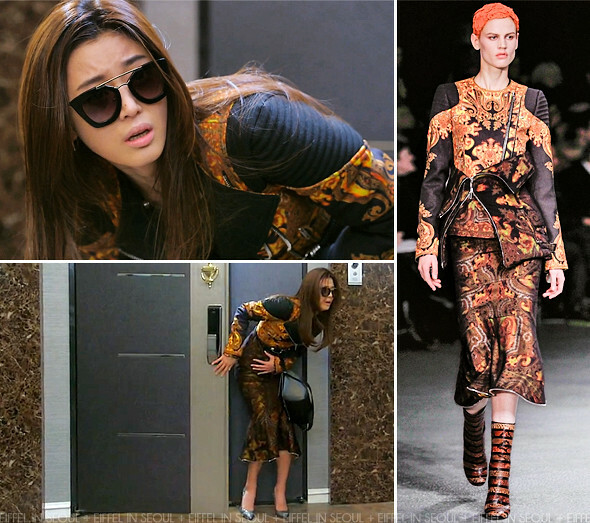 Gianna Jeon Ji Hyun (전지현) opted for a flame paisley printed jacket with a matching twill skirt, both from Givenchy Fall/Winter 2013 collection. 'Pandora' box bag from Givenchy, 'Abel' pumps from Jimmy Choo and Prada eyewear to accessorize her look. It's been quite a while since I enjoyed watching a Korean drama. Episode sent my inner fangirl squealing. Fantastic performance from the main actors. Adding to that, Jeon Ji Hyun's "bimboness" was the cherry on top.